Oh, and did I mention that I’m a beginner? Double Oh, 24’s season premiere started this week. 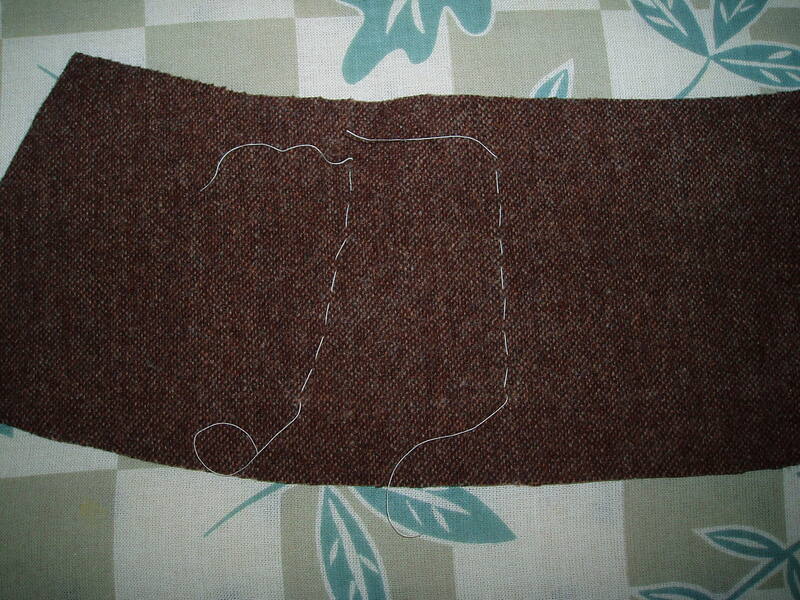 How do you transfer pattern markings to the opposite side of the folded pattern pieces if a tracing wheel and carbon paper don’t work on tweed? Answer: Use tailor’s chalk. Open up the fold and place the pattern piece on the opposite side and transfer markings separately. DUH!!! Or use thread tracing. I did a little of both. To pre-treat or not to pre-treat the polyester lining? That is the question. Answer: Not usually, but I steamed it with my iron just to be sure. I don’t want to spend all this time on a skirt only to have it not wearable after one trip to the dry cleaners. WORD! So, here’s how I accomplished transferring the markings to my fashion fabric, based on Karen’s suggestions above. I don’t know if this is THE method to follow, but it worked for me, and I wanted to share it with you. Since this is a Burda pattern, the seam allowances are not included, so I first chalked the seam lines on the wrong side of the fabric (WS). 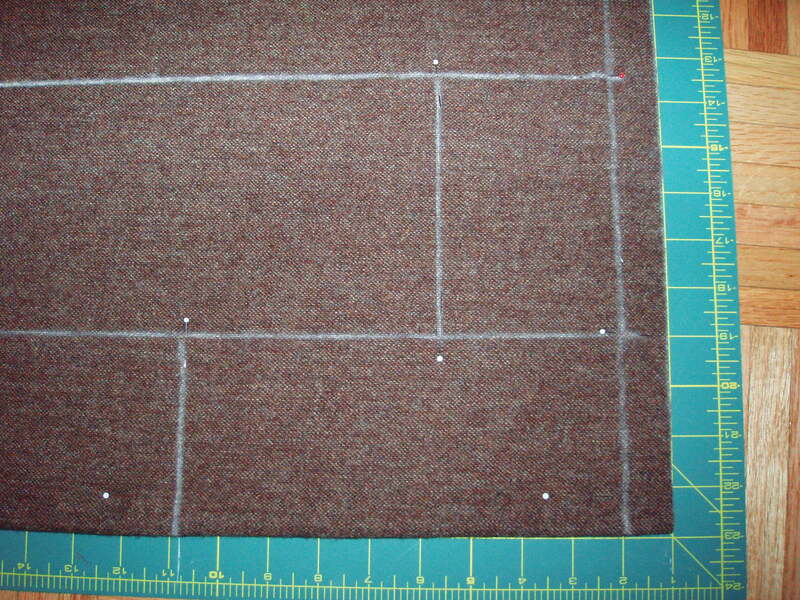 Then I used a ruler to mark the 1 inch seam allowances (SA). I used 1 inch for my SA because I wanted to make sure I had some wiggle room if the next size up (sz 40) wasn’t enough to contain my ample curves. *sigh* Picture below. So one side of the folded pattern piece is marked. Now to mark the second side. I did not open the fabric as Karen suggested, because I thought of something else to do instead. If anyone has an opinion (like, “you are a genius!! !” or “here’s some constructive criticism my dear”), please let me know in the comments. Here’s what I did next: I marked all nexus point with a pin so I could see where they showed up on the other side of the fold. Then, when I placed the pattern tissue on the other side, I could match it up and chalk away confidently. Ta da!!! Next, I cut out the lining, no surprises there and I was back to the tracing wheel/carbon paper method. Phew! Tonight I hope to sew a majority of the skirt. I am not so much a beginner now where I delude myself into thinking I can finish it in one night (well, maybe if you’re Carolyn). You can only pull the wool over my eyes a billion times before I catch on. Yes, I am that quick! Thank you everyone for commenting on my last post about budgeting, I have been in mourning about how much I have to cut back and it was great to read everybody’s excuse method for working sewing into their budgets. Very enlightening. After writing about how excited I was about 2010 and all the cool stuff I want to learn and sew, my mojo promptly went on vacation. I hope it went somewhere nice and warm. Fortunately, I had a sewing lesson this week which forced said mojo to show up to work. Yeah!!! 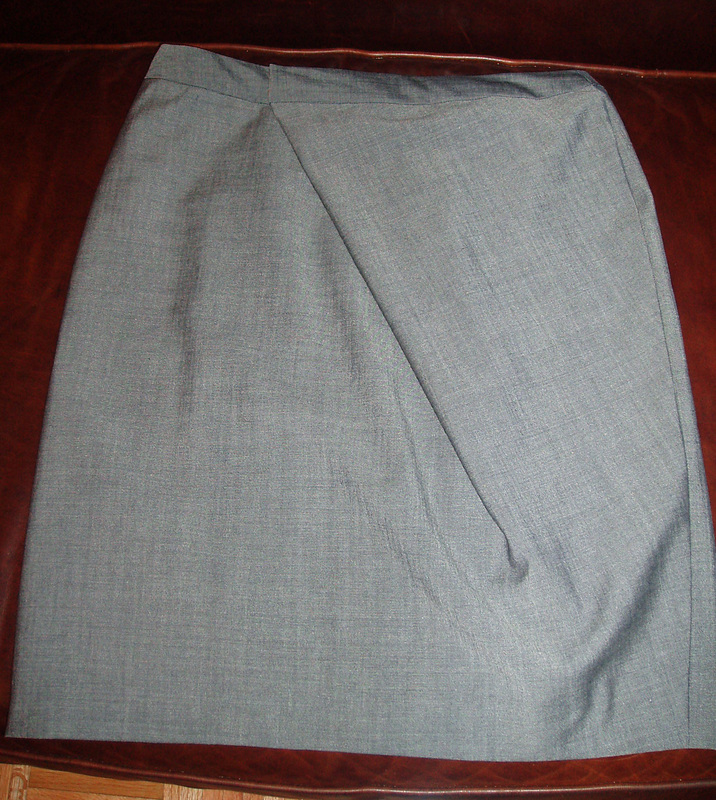 I am currently working on Burda 11-2009-120, the super cute, tweedy, inverted double front pleat skirt. Of course, I looked up some of the reviews of this skirt on Pattern Review and there were some really helpful hints. One person mentioned it ran large. Another said that if you sew the pockets up for the belt, the opening for your hand is too small, etc. I made the muslin with my teacher on Wednesday night. Here’s where my Nike ad comes into play, “Just Do It”. That day, before my lesson, I just didn’t feel like sewing (remember, my mojo was vacationing in the South of France or somewhere equally nice). I wanted to relax and completely veg in front of the tv and go to bed early. I was really tired. But I didn’t want to cancel on Thea and got myself psyched up. Boy am I glad I did. Can I tell you how much I love pleats? And the crisper the pleat the better. Yum! I had read that one of the reviewers did some serious clipping of those pleats at the yoke of the skirt to reduce bulk at the tummy, so Thea taught me how to do that. So cool! I would never have thought to do that and the Burda instructions make no mention of doing that at all. Then cut vertically up from there to the top of the pleat. Then stitch horizontally to the end of your pleat stitching line to hold the shape of the pleat. 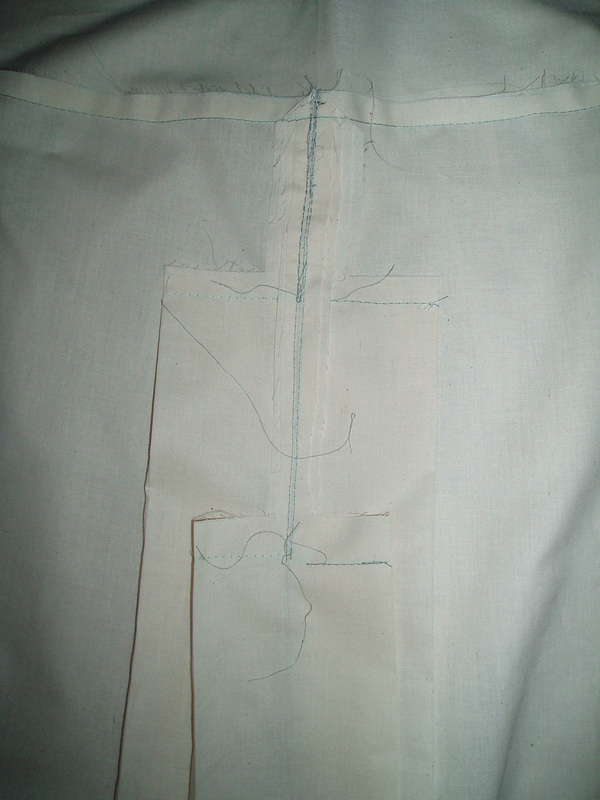 Later, you can tack the top of the pleat to the back of your pocket to make it even more stable. This will help the pleats to stay in place and hold their shape. So, I finished the muslin (up to attaching the waistband and sewing up the side seams) to check the fit. I cut out the size 38. Well, I guess that was wishful thinking, because there was no way I could have zipped it closed even had I inserted a zipper. Whoo boy, was this sucker small. I knew I put on a couple of pounds lately, but really! Is it really necessary for these patterns to mock me??? I will not show you a picture of the muslin on me due to fear of internet humiliation modesty concerns. 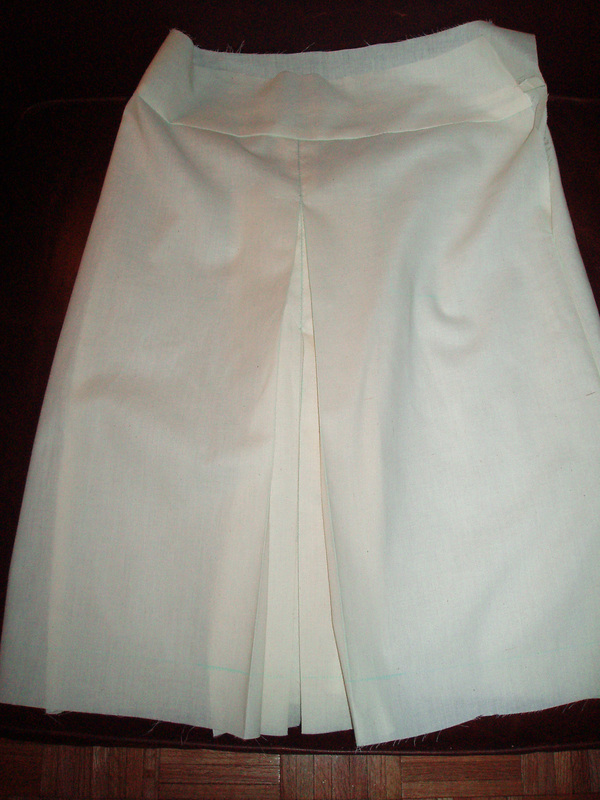 Here is a picture of my beautiful muslin pleats from the right side however, for your viewing pleasure. As for the pockets, I did not bother sewing them on my muslin. If they do end up too small to put my hands into after stitching the belt loops in, Thea suggested that I draw the scoop of the pocket pattern deeper (lower) to widen the opening. I think that will be the perfect solution to that problem. I will be tracing out the size 40 pattern tonight and pretreating my brown tweed so that I can start sewing my beloved pleats this weekend. Can’t wait! Thank goodness for the return of my sewing mojo. Yeah!!! Still at my parents. We stopped at Joann’s today because I mistakenly thought there was a Simplicity pattern sale. Not. Oh well. I still bought my long list of patterns (except the OOP ones of course). One of the major holes in my burgeoning pattern collection is tops. So I stocked up on a few of those. I also bought my first vintage patterns thanks to Carolyn’s prompting. I will post them once they’re in my hot little hands. I am so overwhelmed by all of the positive response I have received on my trench coat here, at the Trench Sew Along, and at Pattern Review. This sewing community (and you too Mom!) are the nicest, most supportive bunch of people. Ever! And speaking of Mom; she asked if Jack was about to hug or kiss Katie. Yes! He adores Katie, one of my gorgeous nieces, who was posing with me as my sister took the pictures. Karen B. said, “I’d love to hear how you attached the lining as that is a total mystery to me.” I didn’t do anything fancy. I just used the same pattern pieces as the fashion fabric minus the facings (plus the seam allowances) and sewed it right sides together with fashion fabric. Surprisingly easy. Then you tack the lining to the shell at the armpit seams and slip stitch by hand the arms to the fashion fabric. Let me know if you still have questions. Rachel said, “I’m particularly jealous of your perfect top-stitching! Do you have a trick to getting it that nice and straight and even?” Honestly, I don’t have a trick and it’s not that perfect either. 😉 But from 2 feet away it looks pretty good. I just did all the edge stitching first and then used the edge of my foot as a guide for how far away to stitch from the edge. It came out pretty evenly the entire time give or take a wobble here and there. Again, thank you so much for all of the lovely comments. I am so proud of this trench. I could not have done it without the help and encouragement of this awesome online sewing community. I would never have attempted it if not for the nudging of Sue! And a big thank you to Karen for graciously guest blogging on the Trench Sew Along. Or, how I got my trench on. 🙂 Be forewarned that this will be a picture heavy post. Pattern Description: 3-2009-112 — From Burda: Material is the special feature! The metallic fibres sparkle on the casually crinkled lightweight poplin and its dark bottle-green colour matches nearly everything. 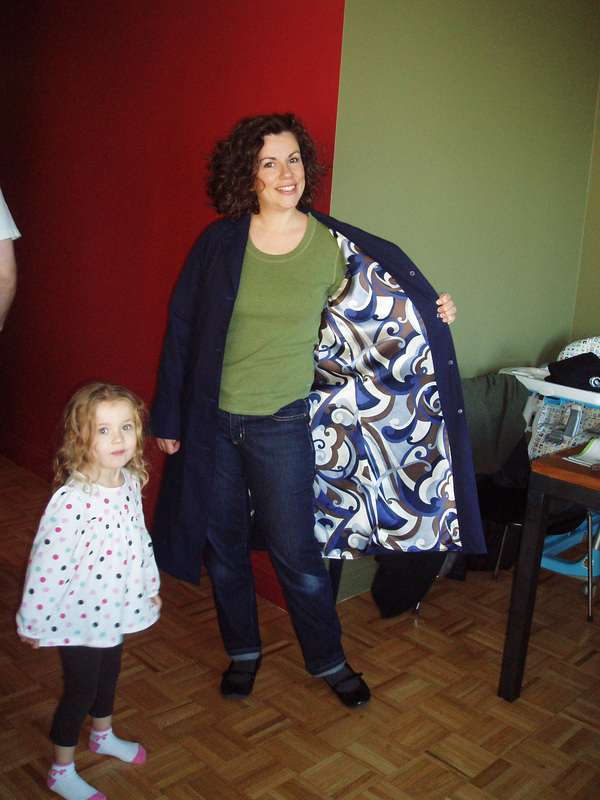 This coat is uncomplicated to sew: it’s not lined and also does without the traditional sleeve tabs. Pattern Sizing: 38-46, I made the size 40 because I wear suits all the time for my job and wanted the extra ease for bulky clothes. Did it look like the photo/drawing on the pattern envelope once you were done sewing with it? Yes and no. I used a different fabric and it had a crisper hand and stiffer drape than the fabric used on the model in the magazine, but the silhouette was the same. Were the instructions easy to follow? The instructions were typical Burda, a little inscrutable, but if you have sewn a coat before, they should make some sense. I loved the simplicity of the pattern. 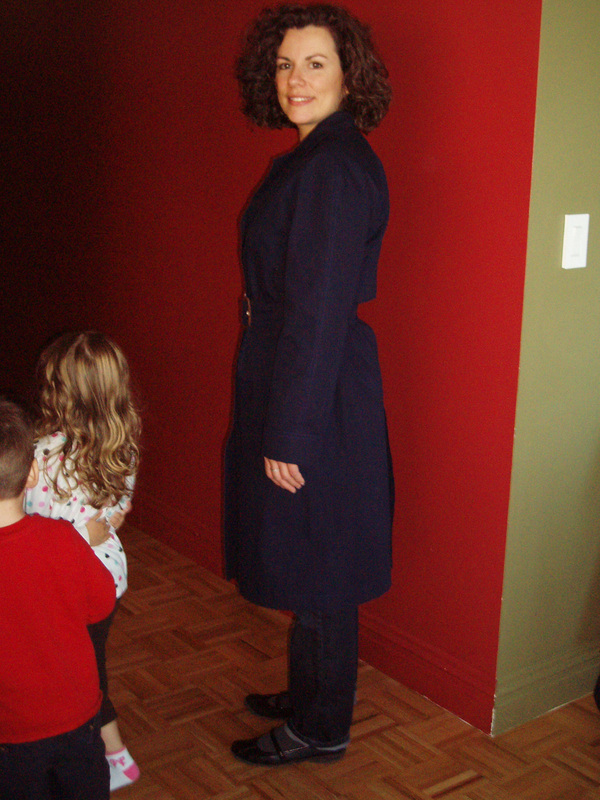 It’s a classic trench look without all the “bling” like tabs, gun flaps, or epaulettes. I wasn’t looking for an overly intense experience for this project. 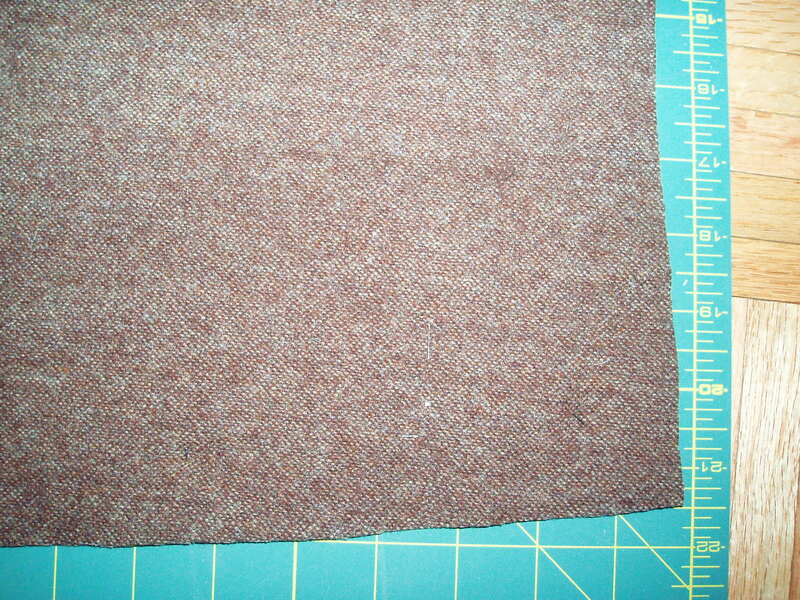 Fabric Used: Navy cotton with peach skin finish on one side for the outer shell. 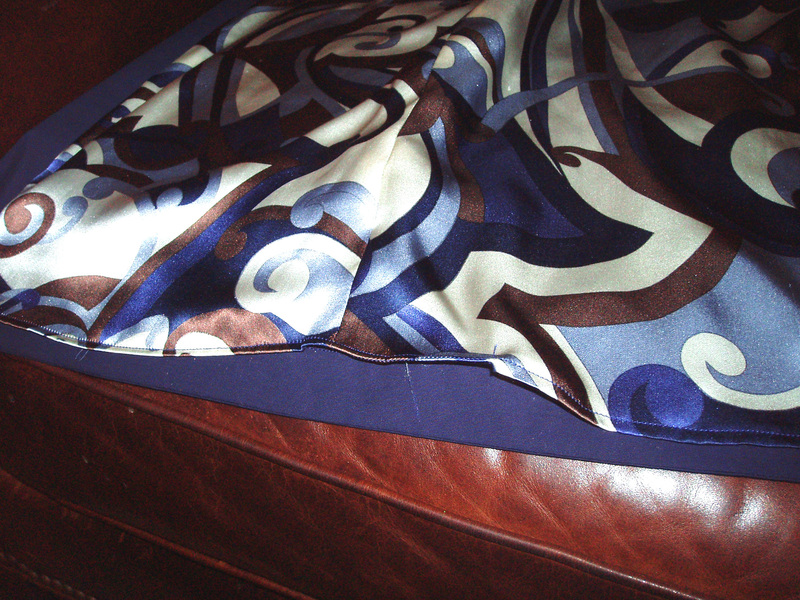 Silk charmeuse for the lining. 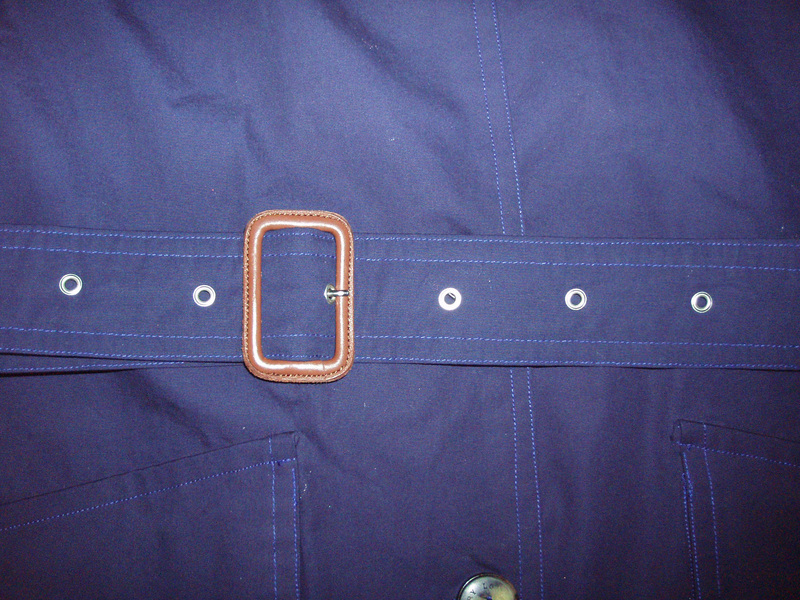 Notions cannibalized from my Burberry trench coat (RIP 11/30/09): buttons and belt buckle. 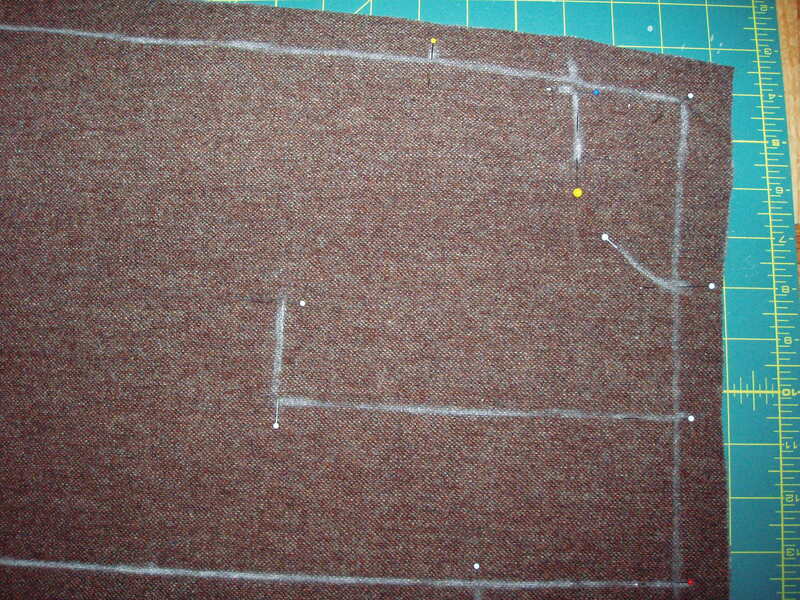 Pattern alterations or any design changes you made: Because I’m a glutton for punishment, I added a lining. The pattern is for an unlined coat, but I didn’t want to add french seams and I wanted a finished look on the inside. It was relatively simple to add the lining, I just used the front and back and sleeve patterns minus the space for the facings. I stitched the lining together and attached it to the facings after I almost completely constructed the coat and attached the collar. I only used interfacing in the belt. Burda suggests interfacing the collars and facings as well as the vent. My collar is a little floppy even with the stiffer cotton fabric that I used, so I definitely recommend interfacing the collar. Would you sew it again? Would you recommend it to others? 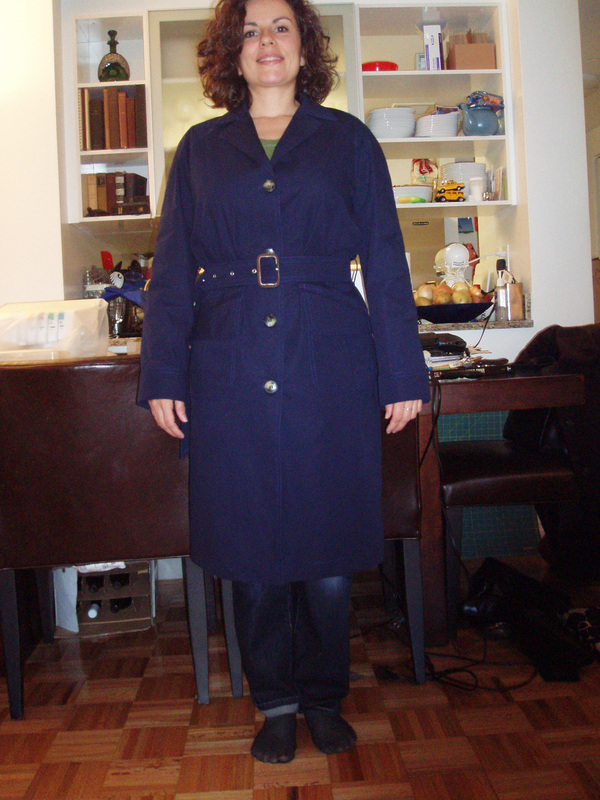 I most likely will not sew this again as I don’t need another trench coat, but it was a great introduction to coat making. I definitely recommend this coat to anyone needing a classic yet simple trench coat. Conclusion: This was a huge learning curve for me. I am a beginner sewist and have not attempted anything so complex before. There were a lot of firsts for me in this project: buttons, button holes, notched collars, eyelets for the belt, slip stitching, adding a lining, adding patch pockets, and top stitching. I’m sure I am forgetting something here, but that’s already quite a list. One more thought in parting: This is meant to be a more casual, unlined coat, and a “quick” project because of those characteristics. 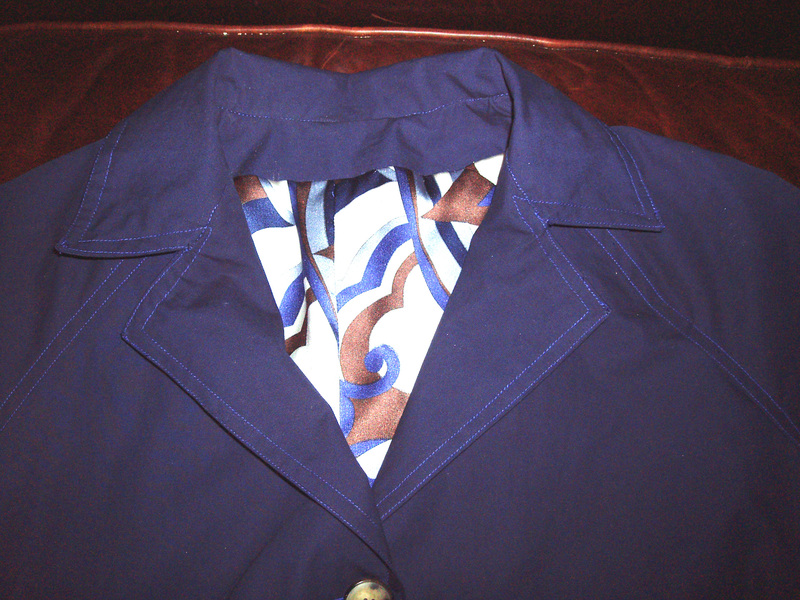 However, due to the simplicity of the pattern, this coat feels a bit unstructured even with adding a lining. Possibly this is due in part to the lack of my interfacing, but I really feel the lack of structure in the collar and shoulders. It’s difficult to put into words, but it feels not as substantial as I think a coat should feel. But that may be because I am expecting more from it than I should. If I want more substance from a trench coat, then I suppose I should put the time and effort into making a more traditional one with all the bells and whistles. Notice the Burberry belt buckle and Prym Vario eyelets. 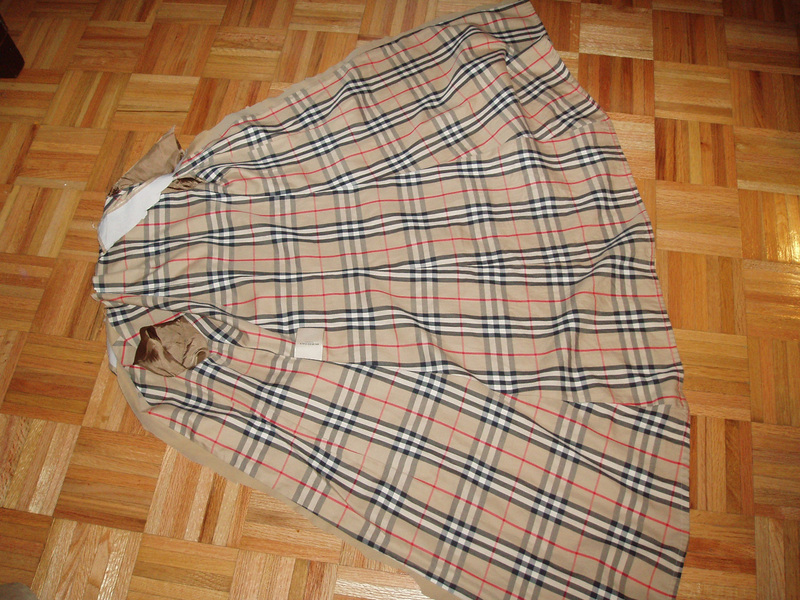 To make the Burberry buttons more secure, I added small buttons on the interior side of the coat. 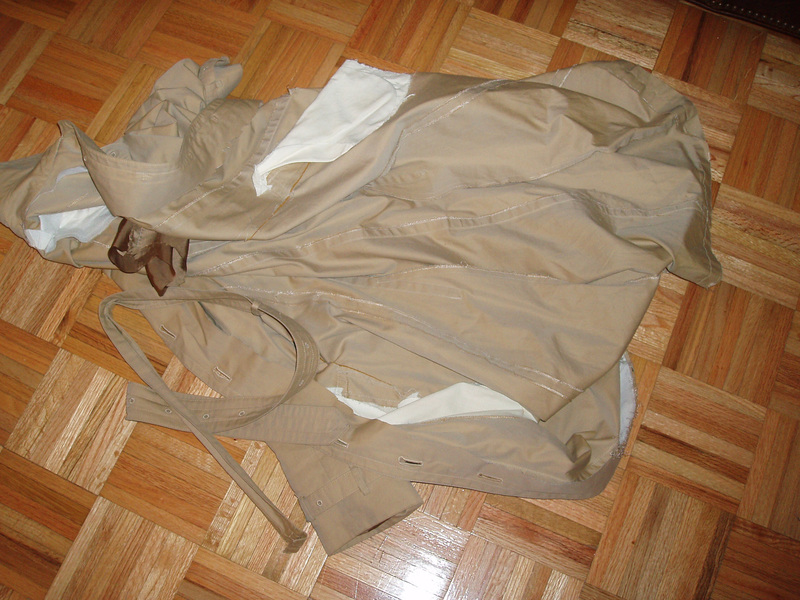 Here’s what remains of my Burberry trench, just the outer shell which is stained beyond recovery, devoid of all it’s notions, and the lining which I will salvage for a future unknown project. 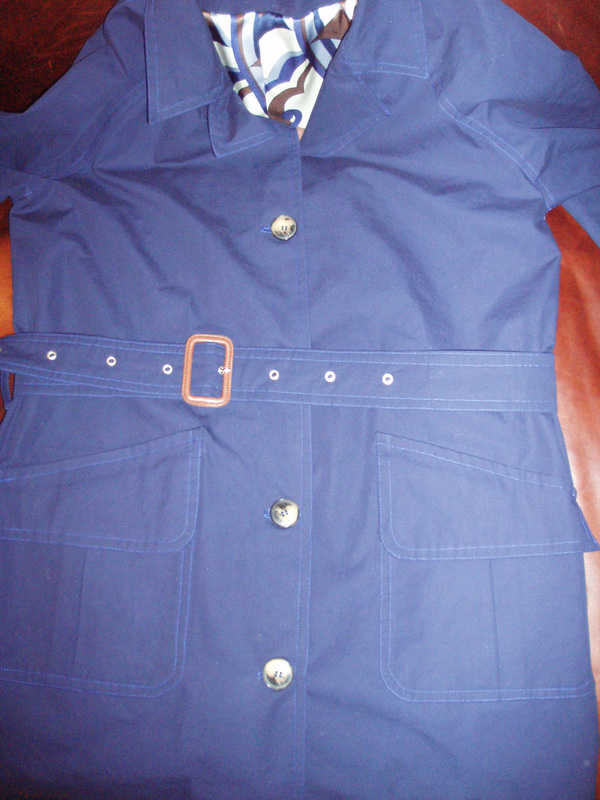 I am looking forward to wearing my trench to work tomorrow, assuming it’s warm enough of course. I am also looking forward to working on something other than a trench coat. 😉 Perhaps Burda 11-2009-120. Ugh. I thought I was going to wear my trench today. I had just the finishing stuff left to do… You know, buttons, belt buckle, hand sewing, etc. But everything takes so long. You think it’s going to be quick and then it’s painfully slow-going. I’m not complaining, although it may sound like it. Really I’m not. I just can’t wait to wear this coat. There is one itty bitty problem with the trench however. THE LINING SUDDENLY GREW OVERNIGHT AND HANGS BELOW THE HEM NOW. Thea and I checked and double checked the length of the hem. I think we even triple checked. How could it suddenly grow an inch and half????? Please let me know how I can remedy this situation. PLEASE!!! I would really like to use my trench coat tomorrow. 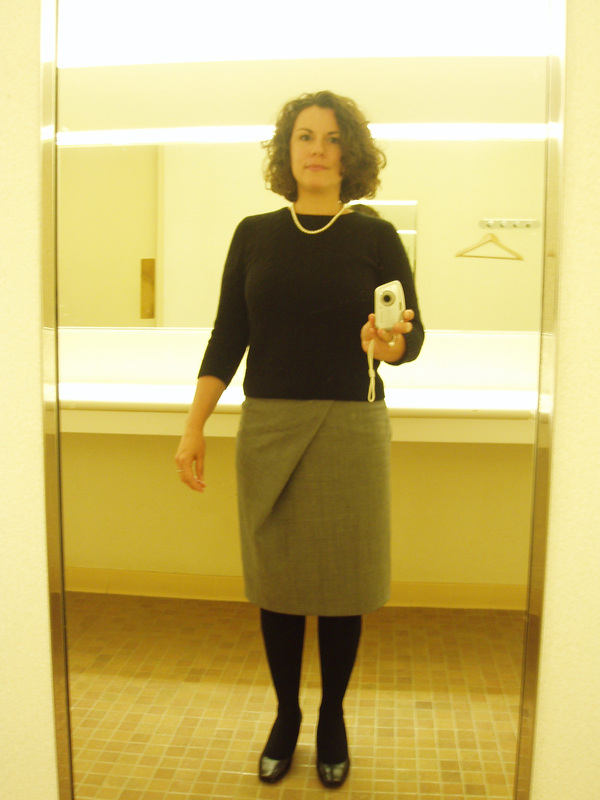 Pattern Description: This pencil skirt is anything but stiff, prim and proper! 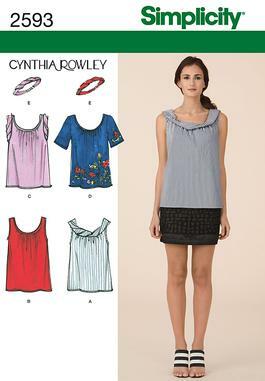 The deep, diagonal, unpressed pleat in front is bothâ€¨a special feature and the waist fastening. Pattern Sizing: 38-46 ETA: I made the size 40 and it fit perfectly. Did it look like the photo/drawing on the pattern envelope once you were done sewing with it? Yes, yes, yes!!! Especially since I used a similar fabric. Were the instructions easy to follow? Shockingly, yes! I am a newbie to sewing and pattern reading challenged, and even I could understand these directions! What did you particularly like or dislike about the pattern? I loved the pleat drape, the ingenious way of using the pleat as a closure and I especially loved that I didn’t have to insert a zipper. Fabric Used: A grey wool/lycra suiting from the Paron’s 50% table. 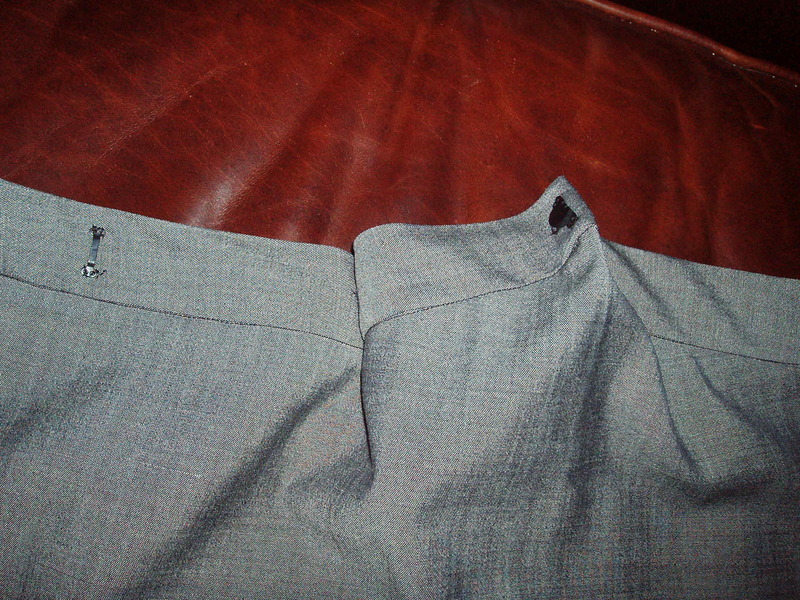 Pattern alterations or any design changes you made: I changed the pleat closure from a button fastening to a suit closure fastening. This worked and I like the clean look of it, but it did make the waist a tidge smaller to put on. So if you have ease issues it might make it difficult to get on and off. I also added a full lining thanks to advice from Karen. I attached the lining to the inner waistbands for front and back skirt panels and then stitched the side seams in one go from the fashion fabric through the waist bands and then the lining. 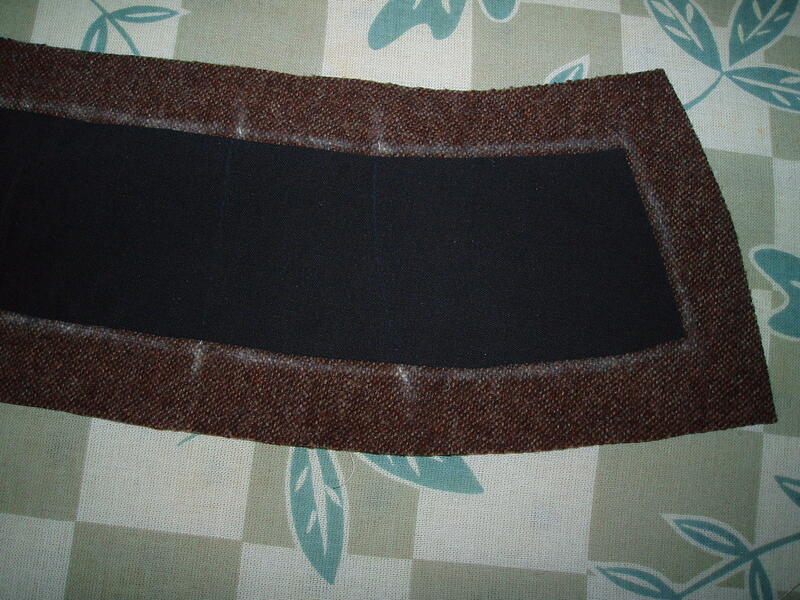 Once both side seams were complete, I stitched in the ditch to attach the front waistband to the back waistband. My ditch stitching isn’t perfect, but it’s pretty good and I didn’t want to spend a lot of time hand sewing as I was anxious to wear this skirt right away. Some people in other sewing blogs had mentioned concerns over too much bulk at the seam, but I didn’t find that to be the case at all and I like how the lined skirt feels on. It also reduced wrinkling! 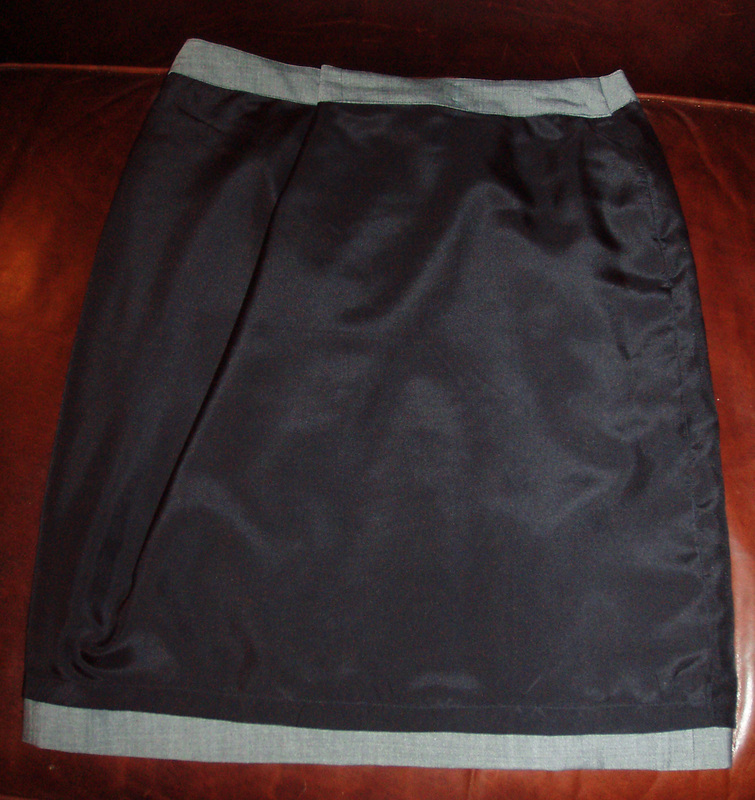 This skirt has a pegged skirt hem which makes hemming a bit difficult, especially with the drape pleat. To counteract this problem I opened that particular sideseam up about 2 inches and restitched it at an angle opposite to the peg shape. 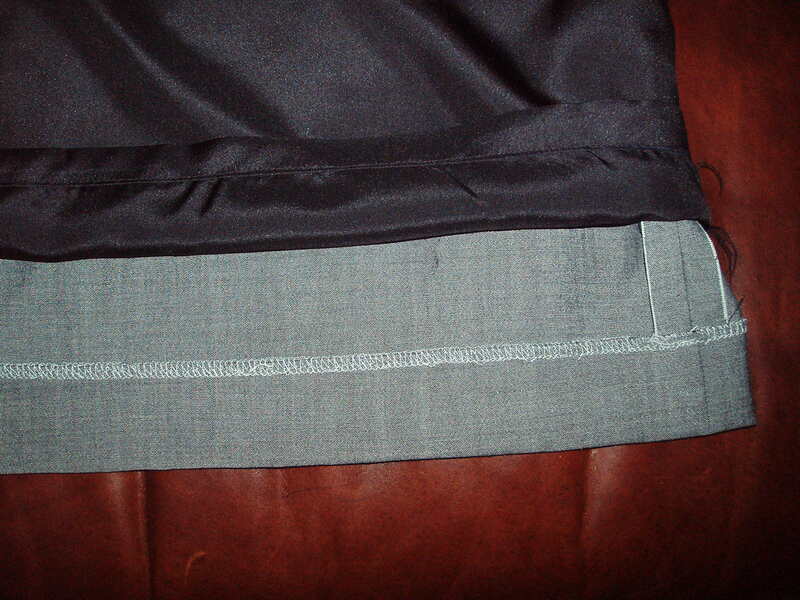 That way, when you fold the hem allowance up, you can hem flat against the skirt instead of making a bubble edge. Does that make sense? Would you sew it again? Would you recommend it to others? I will definitely sew it again for next summer, possibly in a linen. Conclusion: I love this skirt. As a beginning sewist, this super easy project was a huge confidence builder. The end result looked pretty professional. I wore it to work the next day and everyone was impressed. Here are the pics! Now I just have to finish the trench coat. Happy sewing!